Former PNCR leader, Robert Corbin, at the 12th death anniversary observances for Hugh Desmond Hoyte. Former leader of the People’s National Congress Reform (PNCR), Hugh Desmond Hoyte, is being remembered for his calls for a new type of Governance in Guyana. The former President was the one who engineered the economic recovery that sparked a rebirth of Guyana’s development. These were among some of the tributes paid by former PNCR Opposition Leader, Robert Corbin, at yesterday’s ceremony at the Botanical Gardens in remembrance of Hoyte’s 12th death anniversary. According to Corbin, with Guyana again at the crossroads, the people are “quagmired” in a national crisis of unparalleled proportions. 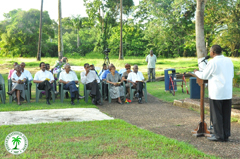 Speaking to several senior PNCR officials, Corbin said that the time has come for another PNC Leader to again rescue the nation in a time of crisis. Born in Georgetown, Guyana on March 9, 1929, Hoyte was a teacher in Guyana and Grenada before qualifying as a British-trained Barrister-at-Law, where he was called to practice at the Middle Temple, London. He took silk as a member of the Inner Bar in 1969 and was designated Senior Counsel (SC) in 1970 when Guyana became a Republic. He entered Guyanese politics in 1968 and served as Minister of Home Affairs, Minister of Finance, Minister of Works, Transport and Communications, Minister of Economic Development, and, Vice President and Deputy Prime Minister for Finance and Economic Planning. 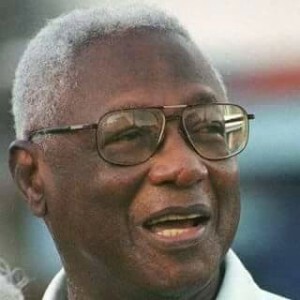 When Prime Minister Dr. Ptolemy Reid, retired in August 1984, Desmond Hoyte was appointed Prime Minister of Guyana, a post in which he served until the death of President Forbes Burnham on August 6, 1985. Corbin argued yesterday that many historians and analysts have over the years since Hoyte’s departure speculated how much better Guyana’s fate as a nation would have been, had he been allowed by circumstances to complete his task as President beyond 1992 or as Opposition Leader beyond 2002. Hoyte, the former Opposition leader said, would also be remembered for not only assuming leadership in difficult times, but also for having the vision to chart a new political direction for PNC and the country; for introducing “electoral and other reforms, for which others want to claim credit today; and, successfully implementing the Economic Recovery Programme.